Princess Tara is pleased to release Book Four of the Princess Tara Chronicles. Part One of the Kālarātri, or Black Night Trilogy. She Was Not Quite What You Would Call Refined. 90,000 words. FREE in eBook format from Smashwords this week only! By Seattle writer Michael Ostrogorsky. Dragons. Zombies. Cannibals. Pterodactyls. Coffee. Parrots and Witches. More coffee! The perfect summer read, whether you're heading to the beach, the cabin, the boat, or just out to your back yard deck. 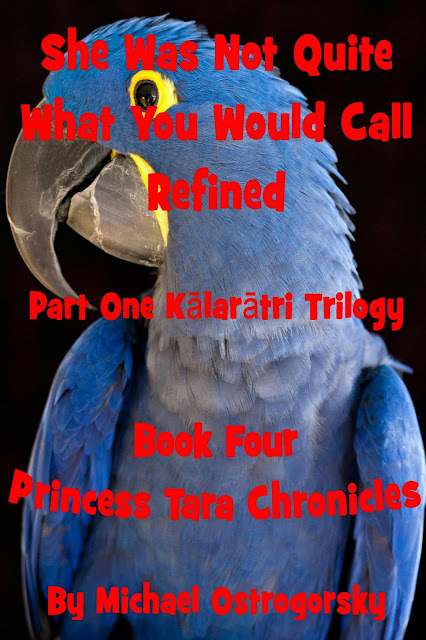 And be sure to check out the Blue Tara Trilogy, the first three books of the Princess Tara Chronicles. Available in eBook format from Smashwords, and eBook and dead tree editions from Amazon!